It's not easy to value the online video giant. But revenue estimates and the multiples assigned to the likes of Facebook, Twitter and Snap suggest it's worth plenty. Alphabet is sitting on a gem. It goes without saying that Alphabet/Google's (GOOGL - Get Report) $1.65 billion purchase of YouTube in 2006 was one of the smartest big tech acquisitions in history, and that the online video giant would be worth dozens of times as much if taken public today. But exactly how much more would YouTube be worth in such a scenario? That's a pretty tough question to answer -- both because Google still doesn't break out YouTube's revenue and operating income, and because it's hard to think of a truly comparable, publicly-traded peer. Estimates for YouTube's annual revenue, nearly all of which still comes from ads, vary a fair amount. But many of the estimates are now above $10 billion. At different points, Bank of America and Mizuho forecast that YouTube would post 2017 revenue of $13 billion and $12 billion, respectively. 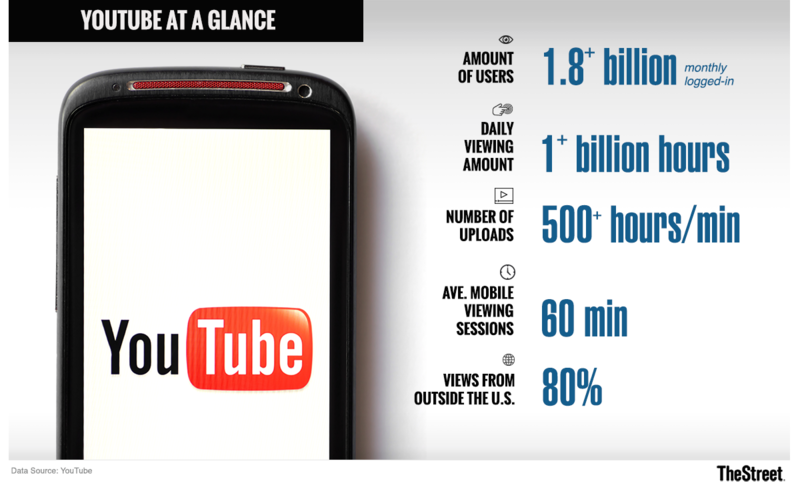 And in February, Baird's Colin Sebastian estimated YouTube is doing around $15 billion in annual sales. Catch more of Jhonsa's work on TheStreet's Real Money platform. Regardless of the exact number, it's safe to assume that YouTube's ad sales are growing at a rapid clip. On its earnings calls, Google has signaled that outside of mobile search, YouTube has been the biggest driver behind its rapid ad sales growth. Last quarter, "paid clicks" on Google's own sites and apps rose 59% annually -- this figure covers not only actual ad clicks, but (among other things) the showing of YouTube video ads that were watched long enough for Google to get paid. From the looks of things, YouTube's top-line growth hasn't been hurt much by worries among some companies -- for example, Cisco Systems (CSCO - Get Report) , which just announced it's halting its YouTube ad spend -- about the running of their ads against content they find to be inappropriate. It also doesn't appear to have been hurt badly by YouTube's attempts to appease such advertisers by "demonetizing" videos that its algorithms deem unsuitable for running ads against, or the backlash such actions have sparked among affected content creators. YouTube's still-rapid viewing growth -- driven by smartphones and to an extent connected TVs -- has a lot to do with its revenue momentum. At last week's NewFronts online video ad event, YouTube disclosed it now had over 1.8 billion monthly logged-in viewers, up from 1.5 billion as of last June. And back in February 2017, YouTube said it was seeing over a billion hours per day of viewing -- that's about three times what Netflix (NFLX - Get Report) witnessed on a record-breaking day in January, and 10 times what YouTube saw back in 2012. The power of YouTube's ad-targeting abilities -- enabled by both its own user data and outside data it can get with Google's help -- have also helped its cause. So have its investments in building quality measurement tools that help companies gauge the impact of a video ad on things like awareness of a product and attitudes towards the brand that's selling it. The rollout of mobile-friendly ad formats such as six-second Bumper ads also hasn't hurt. Nor has a broader shift in video ad dollars towards online channels amid ongoing declines in traditional TV viewing (particularly among the younger demographic groups that YouTube gets so much of its viewing from). And though they don't appear to be huge revenue contributors at this point, the YouTube Red and YouTube TV subscription services can't be overlooked when trying to value the company. Particularly YouTube Red, which provides ad-free YouTube, some original shows and access to the Google Play Music service for $10 per month, and which led YouTube to become the top-grossing U.S. iPhone app in March. Later this year, Google plans to replace Google Play Music -- in many ways Red's weak link -- with YouTube Remix, a music service that's fully integrated with YouTube. What kind of sales multiple does this fast-growing video juggernaut deserve? It's tough to think of a direct comparison. Netflix, which trades for over eight times its 2018 revenue consensus, relies on subscription revenue rather than ads. And whereas YouTube largely relies on ad revenue-sharing deals with content partners, Netflix directly pays its content partners for their material. Facebook (FB - Get Report) , which trades for about nine times its 2018 revenue consensus, is still seeing 40%-plus revenue growth and has some big growth levers left to press, is arguably a better comp for YouTube, given its business model, network effect and market dominance. But Facebook is quite profitable -- in spite of heavy spending on data centers and content security, Facebook's 2018 net income consensus stands at $22.5 billion -- and based on comments made by YouTube CEO Susan Wojcicki and others -- YouTube's profits might still be minimal thanks to large data center and content investments. But even if you discount YouTube's multiples a bit to account for its profit uncertainty, you're still left with a very valuable business. At six times Mizuho's revenue estimate, YouTube would be worth $90 billion. At seven times, it would be worth $105 billion. And those valuation figures would rise a little more if one tacked on a slight premium (say, $5 billion or $10 billion) for the potential of YouTube's subscription businesses. It's worth noting here that even Twitter (TWTR - Get Report) , which is seeing minuscule monthly user and ad revenue growth, is valued at more than seven times its 2018 revenue consensus. And Snap (SNAP - Get Report) , which (though seeing strong revenue growth) is contending with slowing user growth and faces big questions about its long-term profitability, is worth over 11 times its 2018 revenue consensus. All of that suggests a valuation of six to seven times near-term sales is more than reasonable for YouTube. And considering how much YouTube is worth even at such multiples, a good case can be made that the business's value hasn't been fully baked into Alphabet's shares.